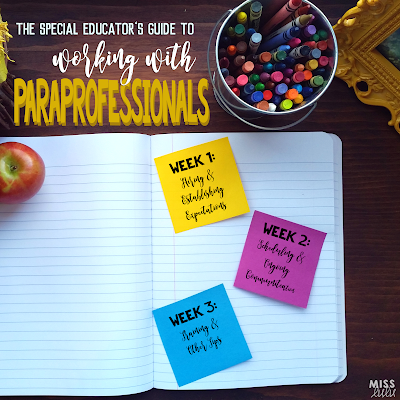 Welcome to Week 2 of the Special Educator's Guide to Working with Paraprofessionals. Let's talk about scheduling & ongoing communication. This is SO SO SO important. I wish I had 12 sets of eyes and could be in 3 places at once. But since I can't, I rely on my paras to communicate with me on how students are doing. I hold monthly staff meetings that I require my paras to attend. I do these after school and I give them the schedule at the beginning of the year so they can plan accordingly. Usually our meetings are less than an hour. If you are limited to a certain number of hours with your paras, try holding meetings on weeks that there is a day off school (not on the day off). That way, they won't go over their allotted weekly hours since they are not working on the day off. If that's not possible, you could also adjust their schedule so they come in an hour late or leave an hour early one day that week. This would allow an extra hour for them to stay for a staff meeting. If that's not possible, I'm not against putting in a movie or having students play a game for an hour so you can hold a meeting. I cannot tell you how important and helpful it is to be able to sit down and address concerns with all of your staff at once. At monthly staff meetings, I talk about changes in the classroom or in specific programs. We always spend a good half of the meeting talking about specific student behavior and how to deal with it. Remember, your paras don't have the training that you do and they probably have a lot of questions that don't get asked on a daily basis. Ask your paras to come prepared with questions (if they concern the majority of the staff. If not, talk to them at a separate time). Sometimes we get busy and don't spend the time we should training and addressing issues during the day. It always surprises me how many things I think that I covered well that I clearly didn't because there are so many questions. This open communication helps me a ton AND it builds our relationship as a team. I want my paras to feel valued and like their opinion matters. After all, they are an essential part of my classroom and I need them! I also try to observe my paras teaching and running programs throughout the school year. I don't always do this as a "formal" observation, rather, I float around the room and pop in on lessons when I have extra time. I think it's important that I make time to be available for my paras, to see what they are doing, and to provide feedback. They need to hear what they are doing well and this gives them time to ask me questions when I can see exactly what they are doing. I am able to provide better feedback and support when I know exactly what the problem is. I am allocated a certain number of paraprofessional hours per week based on my caseload. When I write my para schedule, I start by spreading these hours out across each day. Here are the main things I consider when creating a schedule. 1. Lunch & Breaks: My district does not require that paras get lunch breaks but who wants to work all day without a break? I schedule a lunch break for my full day staff. I don't schedule in other breaks because with the way my classroom runs, there is time at the end of each class period for bathroom breaks, etc. but you may want to consider scheduling in breaks throughout the day. 2. High need times of the day: I always schedule extra paras for the class period that is designated as my prep. This way, I am able to send (almost) all of my students out into other classes with staff and I can actually have a prep. Other high need times include lunch and end of the day clean up. These are times of the day where I find myself short staffed and where things get extra chaotic. I also always make sure I have enough staff scheduled to come before school to help me get students off the bus. 3. Balance in and out of the classroom: My paras all go to classes and lunch with the students. I do my best to balance their time outside of the classroom and inside of the classroom. I feel like it isn't fair for one person to be in gen ed classes all day and another to stay in my classroom. 4. Paras strengths: I carefully consider where to place each person and what to have them teach. My paras are all so great, but just like me and you, they have strengths and weaknesses. Some are more positive and patient and work better with my low students where others are more strict and consistent and do better with students with behavior. Some really understand how to scaffold instruction and do well in general education classes, while some do better following a scripted lesson. I do my best to schedule everyone in areas where they can be more independent and feel better about what they are doing. 5. Para desired schedule: Of course, I also consider their desired schedules and availability when scheduling. I prefer having staff work consistent hours each day rather than alternating days/ hours but I do work around their desires as much as possible. Other tips: I create three schedules- my whole class schedule, my para hourly layout, and a para detailed schedule. The whole class schedule tells me where everyone is and what they are doing. My hourly schedule helps me to create the whole class schedule and lets me know who is working when. And the para detailed schedules break down what each para is teaching, who they are working with and any extra duties for each class period that they work. Detailed schedules are always the last ones finalized, several weeks into school when I am able to see what is and is not getting done and what needs to be assigned to certain people. I also color code the staff in my room. They are the same color in each schedule so it's easy to glance at and see where they need to be. Scheduling is most definitely one of the most difficult parts of this job. Here are some examples of my para schedules and a few freebies here and here. Hopefully they help! You can read more tips here from Week 1 and Week 3. May the odds be ever in your favor. Thank you so much for sharing your para knowledge!! I struggled so much with this last year that I decided it is my #1 priority this coming school year!! !